One of my earliest, and fondest, food memories is of sitting at the kitchen table with my sister in the summer as we shelled fresh garden peas while Mum prepared the meal. 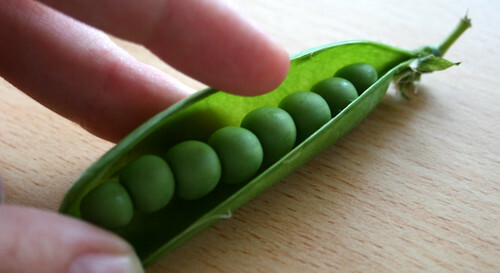 I remember the delight in prising open the pods and teasing the peas out into the big bowl, I remember their sweet taste and Mum gently telling us not to eat them all. Summer peas fresh from their pods are delicately and sweetly flavoured, and the process of podding them can be immensely pleasurable and therapeutic. All the family can join in the fun, creating life-long memories like the one I’ve just described. I look forward to creating such memories with my own children when the time comes. Sadly the rain and devastating floods the UK has seen this summer have destroyed vast amounts of the pea crops so there are fewer to go around. I was fortunate to pick some up at my local farm shop at the weekend and I value them all the more. The peas were a lovely accompaniment to the fantastic pork, apple and cider sausages we bought at the weekend, which I cooked slowly until sticky. To finish the meal I boiled some halved new potatoes for a potato salad, made by smothering the potatoes with mayonnaise and mixing through flat leafed parsley. It was a very homely and very satisfying dinner.